VOORHEES, N.J. -- Chris Pronger was adamant that he's not ready to announce his retirement, but the veteran Philadelphia Flyers defenseman understands his chances of resuming his NHL career are very small. Pronger talked for more than 30 minutes about the medical and emotional issues he's had since he sustained a serious injury to his right eye during a game against the Toronto Maple Leafs on Oct. 24, 2011. 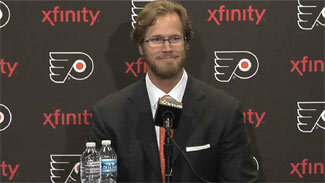 "I don't think you ever know that," Pronger said of his playing future. "I have to continue to work at getting healthy, work at my rehab, doing the various eye appointments and exercises that I've been doing over the last 16 months. … Once I continue to get healthier, we'll see where we're at." The biggest issue for Pronger is the eye injury, which occurred when he was hit by the stick of the Maple Leafs' Mikhail Grabovski. The injury damaged Pronger's eyesight and both his ocular and vestibular systems, and is one of the causes of his concussion symptoms. "I don't think the eyesight part will [come back]," he said. "The peripheral vision has not come back. My eye is not functioning. … And that makes me dizzy when I do a lot of different things. I get light-headed. That's probably the biggest thing posing a lot of problems for me right now. "I've made improvements. I still have [concussion] symptoms. I still get symptoms with loud noises and a lot of moving parts, bright lights, things like that. Not to the level it was, but I still do get them. There's a lot of things that have gotten better. My eye is still troubling. It's not working properly. I don't have peripheral vision. I don't have a lot of the things I have that have worked well for me in the past." Pronger said the most troubling time for him was the first six months after his injury. "I had a couple of obligations that I felt I needed to do and I'm sure the people at those events were like, 'There's nothing wrong with this guy,' but after I would do them, for three or four days I'd be sitting in my house in the dark, just sitting around not doing anything," Pronger said. "My kids are tugging at me and I’m like, 'I'm good, I'm going to sit in this chair and relax.' You get headaches, you start not wanting to do anything, you get a little depressed, you're not able to work out, you're not able to do anything you want to do. You try to work out and you get nauseous and a headache and you want to go lay down. It's an awkward feeling and something … when you have an experience you don't fully understand what [the doctors are] talking about, it can be debilitating. I think the biggest part is the depression and how you feel about yourself and how you feel about the injury and how dark you go down." Pronger said part of what put him in such a bad place emotionally was the sudden loss of a routine that had been such a big part of his life for so long. "You miss the routine," he said. "That's the biggest thing. That's probably the biggest thing that put me into a hole, that you don't have a routine, you don't get up and work out and then eat and then go to the rink and practice an all those things in a set schedule. I had a set schedule since I was 15, since I started playing junior hockey. When you don't have that sometimes you try to find something new and it's difficult. But I kind of have a bit of a routine now -- I go to my different therapy appointments and work out and next thing you know I'm carpooling and picking up my kids." Pronger also admitted that in the early days of his injury his home life wasn't very good, but as his condition has progressed, that's improved as well. He and his wife have two sons, ages 10 and 8, and a 4-year-old daughter. "You get agitated very quickly," he said. "When the symptoms start piling up, you start getting a headache and it gets loud in the house, there's bright lights, kids running around screaming, all that stuff, you are on edge as it is. You're [angry] that you are not playing the game you love, you're [angry] that you can't go do what you want to do every day. Then you are even more [angry] because you've got a headache and it's getting worse and worse and your eyes are bothering you and you're light-headed and dizzy and your kid comes over and you snap. You're not being the father that you want to be. It changes your personality a little bit. I've gotten a little better with it. But I still get a 'Grrr' on from time to time and got to catch myself, kind of take myself out of the room and make sure I'm a little better." Pronger said those darkest days are behind him now, and he's progressed to the point where he's allowed to push himself to see how far he can go before his symptoms occur. "I'm at the stage now where they want me to push the envelope to see where symptoms occur," he said. "I get up, I have breakfast, go work out, go to my eye appointment, come home, relax for a couple hours, and then go get my kids from school and start carpooling them around to their different activities and things they do. Really it's just about pushing the envelope a little bit, doing a little bit more, and then when I have symptoms, back off a little bit and keep trying to move the threshold." Whether that threshold allows him to play again, however, is doubtful. Leading Pronger's treatment has been Dr. Micky Collins, the executive and clinical director of the University of Pittsburgh Medical Center Sports Medicine Concussion Program. In a release distributed by the Flyers, Collins recommended that Pronger never play again. "[Pronger] has gone through extensive rehabilitation and is functioning at an improved level," Collins wrote. "We expect him to lead a full and complete life off the ice. However, as a clinician who sees concussions every day, I believe the best and safest advice is that he not play hockey anymore given the high likelihood of continued vulnerabilities." 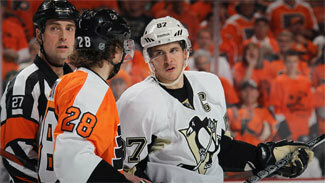 Pronger understands Collins' feelings but said he's not quite ready to leave the game behind. "I have to continue to work at trying to get healthy and that's my main focus and goal," he said. "We'll see what happens." If Pronger is unable to play again, he said he'll leave the game with no regrets. In 1,167 games with the Hartford Whalers, St. Louis Blues, Edmonton Oilers, Anaheim Ducks and Flyers, he had 698 points and 1,590 penalty minutes. He won the Hart and Norris trophies in 2000, and played in three Stanley Cup Finals, helping the Ducks win the Cup in 2007. He also has a Memorial Cup championship, a World Junior Championship gold medal, a World Championship gold and two Olympic gold medals. "I've got no regrets," he said. "I played to the best of my ability. Played to win and was fortunate enough to have won a Stanley Cup and a couple gold medals and played on some really good teams. … I'm not going to look back and say I wish I could have done this or that. I can say I left the game, if that is it, with nothing to prove."